New Jersey-based Robert DellaFave is a contributor to a variety of publications oriented toward the regulated U.S. online gambling industry. A lifelong gamer and poker player, Robert also works as a game designer. Fueled by strong performances from Golden Nugget, Tropicana, Resorts and the NJ online gambling industry, Atlantic City casino revenue showed a minor uptick in February, continuing upon what’s becoming a prolonged growth trend for the boardwalk city. The latest revenue report from the NJ Division of Gaming Enforcement all but confirms that last year’s growth was no fluke. In February 2017, industry revenue climbed to $205.4 million, representing a 0.32 percent uptick over the same month last year, when AC generated $204.7 million in casino revenue. Admittedly, this may not seem like a significant gain, but there are two variables at play that brighten the picture. For one, Atlantic City consists of one less casino than it did last year, as Trump Taj Mahal shuttered its doors in October. Last February, Taj accounted for 5.91 percent of industry revenue. Furthermore, last February was one day longer. On a daily basis, AC revenue grew more along the lines of 3.9 percent. Taken together, this means that the city’s remaining seven casinos, combined with the NJ online gambling industry, have more than compensated for the loss of the Taj. On another positive note, total industry revenue for February was up 0.34 percent over January, despite January’s longer length by three days, including one extra weekend day. As was the case for 2016, Atlantic City would have not shown a year-over-year profit if it wasn’t for the explosive growth of NJ gambling websites. Collectively, AC’s land-based casinos generated $186.6 million in February, compared to $189 million last year, reflecting a 1.75 percent decline. By contrast, online revenue was up a rather staggering 26.9 percent, climbing from $14.8 million in February 2016 to $18.7 million last month.That proved just enough to push total industry revenue into the black. 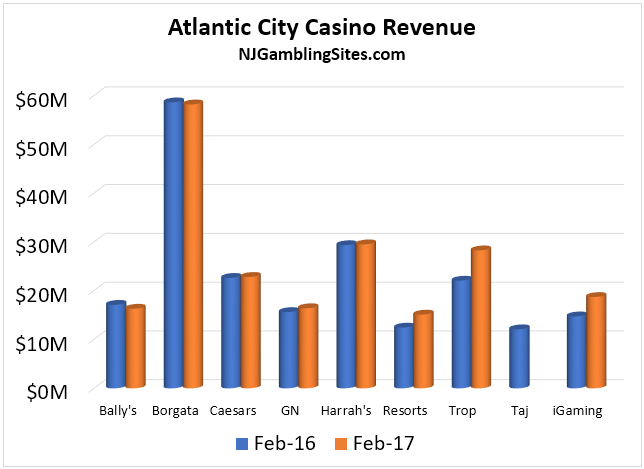 Notably, February marked the first time that AC casinos generated less than ten times the revenue as the state’s online casino and poker sites. Online gambling has proven particularly beneficial to Atlantic City during the cold winter months, when land-based revenue tends to bottom out due to reduced tourism. Online gambling spikes because residents engage in more indoor activities. Caesars NJ online may have stolen the spotlight in January, but it was two unlikely heroes that paved the way for February’s growth: Tropicana and Resorts. Tropicana was the biggest gainer, with year-over-year revenue climbing 28.1 percent. The casino also fared well on the online front, as revenue climbed 6.6 percent — although that figure lagged behind the online gambling industry as a unit. Resorts clocked in as the second biggest mover, as revenue rose 21.3 percent to $15.1 million. Also worth noting is that Resorts’ revenue increased 18.1 percent over January, most among Atlantic City casinos. Three other casinos were in the black: Caesars (+0.87 percent), Golden Nugget (+5.02 percent), and Harrah’s (0.55 percent). Golden Nugget made monumental strides on the online gambling side, becoming the first individual operator to take in over $5 million ($5,175,795 to be exact). The industry leader’s revenue was up a staggering 66 percent over last February. What Are The Best Times To Play Various Online Poker Games In New Jersey? One of the primary drawbacks of NJ online poker rooms is its low foot traffic relative to international markets. At present, New Jersey does not share liquidity with any other jurisdiction. And while this may change in the near future, for now players are advised to choose the times they play wisely. The good news is, that for at least a few hours during the day, online poker lobbies are bustling with enough activity to satiate most players. And a few select formats and stakes do run around the clock. When are the best times for NJ online poker cash games? For players looking to mix it up at the PokerStars NJ cash game tables, the best time to play is generally between 6 p.m. and 1 a.m. on weekdays, and from 1:30 p.m. to approximately 2 a.m. on weekends. Reason being is that this is when the bulk of the site’s tournaments are running. As many grinders already know, a robust tournament schedule tends to drive cash game traffic. No Limit Hold’em cash games do run during the earlier parts of the day, but the available games are somewhat limited, with stakes ranging from $0.05/$0.10 to $0.25/$.0.50 drawing the majority of players. But once prime time hits, it’s not totally uncommon to find a rather eclectic blend of NHLE, Omaha and mixed games running. Granted, alternative format games do sometimes play short-handed, but at least there’s a few stakes options. What about online poker tournaments in New Jersey, when do they run? Technically, tournaments on PokerStars are scheduled around the clock. But that hardly means all of them get off. In fact it’s quite common for non-guaranteed tournaments running during the overnight hours right through the early afternoon to be cancelled. Guaranteed tournaments are a bit of a different fruit, getting off with regularity. On weekdays, the major guaranteed schedule starts at 1:30 p.m. with The Big $15 ($1,000 guarantee), and continues through 12:45 a.m., when the Moonlight 2nd Chance ($20 buy-in, $500 guarantee) runs. In between, there are an array of guaranteed tournaments to choose from, with buy-ins ranging from $5 through $100. The biggest weekday guarantee is $8,000. For gamblers with limited playing time, the best day to mix it up at the tournament tables is on Sunday. Even on Sunday, there isn’t a dizzying amount of options, but the guarantees are substantially larger, spiking as high as $40,000. There’s also a blend of $5 and $10 tournaments that feature guarantees as high as $5,000. Granted, they’re no Sunday Million, but still offer good value for a small and closed liquidity marketplace. Any sit & goes at PokerStars NJ? Not too many, no. PokerStars doesn’t do much to advertise or promote its regular sit & go games, and the traffic reflects that. The best, and really the only, time to play sit & goes is during peak liquidity hours, which range from about 8 p.m. – 12 a.m. on weekdays, and 3 p.m. – 12 a.m. on Saturdays and Sundays. Even then, it’s rare to find more than a dozen low-to-mid stakes NLHE running. One of the primary reasons why the sit & go lobby is all but a barren wasteland on PokerStars is because the site has rolled out a faster paced, more gambling-oriented version of the vertical. Spin & Go’s are three-man hyper turbo sit & goes that feature randomized payouts, ranging from two times a player’s buy-in all the way up to 10,000x during select events. Naturally, the payouts are weighted heavily toward the lower end of the scale, but there has been at least one instance of a player parlaying a $10 buy-in into a $100,000 score. The allure of six-figure payouts has clearly captured the attention of NJ online poker players, as the format has become, without a doubt, the most popular in New Jersey. It’s also small market-friendly, as it only requires that three players take a seat, as opposed to six or nine for traditional sit & goes. We can say with some clarity that Spin & Go’s on PokerStars run around the clock. Granted, the frequency of games is much lower during off-peak hours, but NJ online casino players should never have to wait more than a minute or two for the reels to spin. Games get off instantaneously during peak liquidity hours. Any particular time of year to play? Players will find the best action on PokerStars, and on just about any NJ gambling website for that matter, from primarily November through February. That’s because people tend to gravitate toward indoor activities during the colder months. We’d estimate that liquidity is a good 20 percent higher during the winter than the summer. What Are The Best Depositing Options Available To NJ Online Casino Players? Back when legal NJ online gambling first went live in November 2013, getting funds online could often prove an arduous task. High rejection rates, limited depositing options — the industry was hindered by a number of payment processing hurdles that undoubtedly resulted in waves of disgruntled customers. The good news for players is that the game has changed. Today New Jersey gambling websites such as Pala online casino and Golden Nugget Casino offer players a wealth of depositing options, most of which boast exceedingly high acceptance rates. But with so many options now available, players can find it cumbersome to find one that fits their specific preferences. That’s where this brief guide comes in. Although the e-Check (ACH) depositing option has been around since the industry’s infancy, it remains one of the single most reliable and convenient methods of depositing funds online. Better yet, there isn’t a single NJ online casino site that doesn’t offer the option. In order to utilize e-Checks, players must first possess a valid checking account. The industry’s rigid verification standards demand that a checking account be in the same name as the player’s registered online gambling account. On balance, players have more than a 80 percent chance of their deposit being accepted. Sometimes, the ACH deposit attempt will raise a red flag from Certegy Check Services, which acts as the processor of online gambling ACH transactions in New Jersey. In this instance, players are advised to get in touch with Certegy to pinpoint the issue. The problem may be as simple as an incorrectly entered account number, or a higher than allowed deposit amount. In the latter instance, Golden Nugget customer service advises speaking with Certegy to see if it will raise player depositing limits. Another real draw of ACH is that successful transactions process instantaneously, and are available for immediate use on the site. That, and withdrawals via ACH are typically lightning fast, often taking no more than 1-2 business days to hit bank accounts. The introduction of PayPal in 2015 as a depositing method was cause for celebration among NJ online casino sites, and for good reason. PayPal is by far the most renowned and actively utilized third-party payment processor in the US, with reports of over 190 million users worldwide. It’s also a name that has become synonymous with trust, lending even more credibility to online casinos that incorporate it. Players attempting to make a PayPal deposit will be redirected to the PayPal page. They will then be prompted to log in to PayPal, and confirm their payment method before proceeding. After successful authentication, funds will be available for use immediately on the site. Players can also choose to withdraw via PayPal, but in order to do so, they must first use the method for a deposit. If there’s one drawback to PayPal, it’s that the method isn’t prevalent enough. To date, only a handful of NJ gambling websites list it, including Caesars-affiliated sites and Pala online casino. But as regulated online gambling becomes less taboo and more widely accepted, expect PayPal’s availability to grow. Not every player has a bank account or credit card. For them, there are two options. The first is cash at the casino cage. Unfortunately, this is only a viable alternative for players who either live within close proximity of an Atlantic City casino, or who don’t mind hiking down to AC to complete a transaction. The other is 7-Eleven Pay Near Me. Players that choose the method will be sent to the Pay Near Me website, where they’ll be prompted to enter in their 5-digit zip code. Then, they’ll be asked if they’d like to print or have instructions sent to mobile. They can also locate one of the dozens of 7-Eleven stores in their area via the site. Go to a participating 7-Eleven store. Tell the cashier the amount. Press the ‘At Cashier‘ button (mobile only). Ask the cashier to follow next listed steps (mobile only). Get receipt, and the store will notify the online gambling operator of player payments. Players that choose to print will generate a unique barcode, as opposed to using their mobile device to complete the transaction. Limits for Pay Near Me transactions are a bit tight — up to $500 per transaction, and $10,000 per 30 days on Pala online casino — but certainly not unreasonable. And the good news is that once the transaction is completed, funds will generally hit accounts in no time at all. For Pay Near Me players wondering how they’ll get their winnings off their online gambling account — in the absence of a checking account, they’ll probably have to have the online casino send them a physical check. These generally take about 7-10 business days to hit player mailboxes. Which NJ Online Casino Games Offer The Best Returns To The Player? These days, New Jersey online gambling websites offer such an abundance of similar games, that it can be difficult to gauge which variants provide the best player returns. Seemingly inconsequential rule tweaks or even a change in betting denomination can often mean the difference between a game that affords players a great chance to win and one where the player, sans a lot of luck, will be at the mercy of the house. Skill-based or luck-based casino games? The hard and fast rule is that games that require a measure of player skill typically offer better returns than luck-based games like slots and roulette. However, if played poorly, good games like Jacks Or Better and Blackjack can eat up a player’s bankroll faster than even the tightest slot machine. Luckily, there are plenty of resources available on the internet that run down optimal strategies for these games. And there’s no rule preventing players from using a cheat sheet while playing these games online. If played perfectly, the best skill-based games at NJ online casinos offer returns that exceed 99.5 percent. Tropicana Casino gets the nod for boasting more of these virtually break even games than most other NJ online casinos. Do good luck-based games exist? All of this is not to say that all luck-based games are bad plays; but finding good deals might require a bit more homework. For roulette players, the task is simple — look for games where the wheel only has one zero. The difference between a single (European) and double zero (American) game is tremendous — 5.26 percent vs. 2.70 percent. The good news is that whereas most land-based casinos only offer European Roulette to high-stakes players, the game can be found at virtually every NJ online gambling website — at stakes that won’t require players to dig deep. Finding a loose slot game can be a bit more research intensive, but some sites do offer shortcuts. Golden Nugget Casino players can clink on the info tab of any slot game to see pertinent information like min and max wagers, max payouts, volatility and most importantly, the RTP or return-to-player. Generally speaking, players will want to seek slot games with an RTP of at least 97 percent. A few good examples are Blood Suckers, Jack Hammer, and StarMania. It’s certainly worth noting, that a slot’s RTP sometimes varies based on select circumstances. For instance, a Spin Sorceress player who sets the game’s Super Bet setting to the maximum will receive a much better RTP (97.06 percent) compared to a player who doesn’t enable the feature. The catch is that players will have to invest more money per spin. Same deal for Monopoly: Big Event, which offers players Big Bet Games that return 99 percent. What are the best games in the New Jersey online gambling market? As suggested earlier, the very best games in New Jersey possess at least some skill elements, and must be played optimally to achieve the best results. On top of that, they offer favorable rule sets, such as 9/6 payout tables for Jacks Or Better or stand on soft 17 for Blackjack. Single Deck Blackjack — 99.74 percent return game found at Tropicana Casino and Virgin Casino. Single deck games are superior to shoe games, even if the other rules aren’t as favorable. Deuces Wild — 99.73 percent return game found within the Triple/Five Play video poker terminal at Trop/Virgin. Jacks Or Better — 99.54 percent return game found at most NJ online casinos. Play the single line Game King version only. Baccarat — 98.94 return on banker bets. Play EZ Baccarat at Betfair Casino or Live Dealer Baccarat at Golden Nugget Casino. Are NJ Online Casino Sweepstakes Drawings Worth Participating In? While just about every NJ gambling website promotion increases the value of playing real-money games, some promotional vehicles are perceived as more valuable than others. Sweepstakes drawings typically rank near the bottom of the list, mainly because players don’t see themselves having a realistic chance of winning. It’s difficult to fault that logic. By design, sweepstakes typically pay out one or two massive prizes, a few slightly smaller ones, and a moderate number of tiny awards. Everyone else goes home empty-handed. Land-based casinos are more heavily trafficked than New Jersey online casinos, by a wide margin. In 2015, Atlantic City’s eight casinos generated $2.24 billion, versus $125 million for NJ online casino sites. Online casinos typically place a cap on the number of entries a player can earn per day, which gives casual gamblers a fighting chance. On most sites, the promotional period is only a few days. Land-based sweepstakes promos often last a calendar month, or more. In short, NJ online casinos will generate far fewer entries than those held at brick and mortar venues. Fewer entries, better chance to win. So, if there’s any market where sweepstakes promos are worth participating in, it’s in New Jersey. How do you estimate the value of a NJ online casino sweepstakes promotion? There’s no quick and completely accurate way of estimating the average player value of a sweepstakes promotion, but making a rough guess isn’t all that difficult. Let’s say a Virgin Casino sweepstakes guarantees $10,000 and pays 100 players, which is about par for the course. If we knew how many total entries there were, we could easily assess the promotion’s worth by dividing the prize pool over total entries. For instance, if there were 5,000 entries, then the average value of the promotion would be $2 ($10,000 prize pool/5,000 entries). Predicting total entries might initially seem impossible, but it’s not. Revenue charts provide a big clue, so let’s start there. Together, Tropicana and Virgin Casino rake in approximately $3 million a month in gross gaming revenue, which breaks down to roughly $50,000 per site, per day. Assuming Virgin holds $0.05 per every dollar wagered — a fair estimate — then $1 million ($50,000/0.05) is being wagered on the site daily. Now, we need to guess how much the average player wagers per day. This is impossible to know for sure, but given the tendency of the state’s many high-rollers to wager $1,000 per day or more, $500 feels about right. So, if $1 million is wagered per day, and the average player wagers $500, that means there are 2,000 active players per day. Actives players is not synonymous with total entries, but close enough. Great. Now just plug in $10,000 for prize pool, and 2,000 for total entries in the following equation. The average player value in this example is therefore $5. In reality, there are other variables to consider, such as the length of a sweepstakes, whether the entries are capped at a certain number, and what percentage of players actually opt-in. But again, for our the average gambler’s purposes this is good enough. Once players have estimated the number entries, determining their odds of winning a prize of any sort is easy. Just divide the number of winners, in this case 100, over the number of entries (2,000). In this instance, 5 percent of players will walk away with something. How do sweepstakes stack up against match bonus offers? Outside of the initial welcome match, the monetary value of match bonuses tend toward the smallish side. Caps between $50 and $100 are the norm, so let’s use a number in this range as a guideline. If players receive a 100 percent match up to $100, but must wager the bonus 20 times on slots before it clears to their cash wallet, the effective cashback rate is 5 percent. By comparison, a sweepstakes promotion might task a player with wagering $50 per entry, capped at three entries. At an average return of $5 (as per the example above), the effective cashback rate is 3.33 percent — lower, but certainly not that much lower, than the cashback rate of the average match bonus. What Are The Lowest And Highest Stakes Available At NJ Online Casinos? Perhaps one of the main advantages of playing at a New Jersey online gambling website over a land-based Atlantic City casino, is that online sites offer stakes for all player archetypes. In particular, budget conscious players won’t have to break the bank playing real-money game offered online. What are the lowest stakes found at NJ online casinos? The overwhelming majority of NJ online casino slot terminals are penny slots. Just like penny slots found at brick and mortar venues, the minimum bet to cover all online slot pay lines averages between $0.20 – $0.50. Where the betting spreads differ dramatically between live and online is at the blackjack, roulette and other tables. Atlantic City players will be hard pressed to find a table game that offers a table minimum of less than $10. Online, it’s not uncommon for a blackjack game to require a minimum wager of just $0.10. A solid example of a budget friendly blackjack game is BlackJack Micro Limit, found at Golden Nugget Casino and other NJ online casinos. The spread at this game ranges from $0.10 – $10. Unfortunately, the rules of the game aren’t entirely favorable. However, for just a $1 minimum wager, players can play Vegas Blackjack, which does offer good rules — returning over 99.5 percent to the player with optimal play. Another benefit of Vegas Blackjack is that players can play up to five hands simultaneously. This allows players to reduce their variance, all while wagering just half of what they’d be forced to bet on one hand of live blackjack. Moving to other games, at Tropicana Casino the minimum wager for Pai Gow Poker, Three Card Poker and Single Zero Roulette is set at $1 or less. All of these games offer rules that are on par, or better, than what AC players are accustomed to. There are betting advantages to playing video poker games online as well. Namely, wagers for single-line Game King games such as Jacks Or Better or Double Double Bonus start at $0.10. Worth noting is that at any denomination, players will win 800 coins for hitting a Royal Flush. This stands in stark contrast to land-based machines, which only offer full-pay on Royals if a player bets five coins at a time. Also, all single line games found at Golden Nugget Casino and Tropicana Casino offer pay schedules that return close to, if not over, 99 percent to the player. What are the highest stakes found at NJ online casinos? High stakes players won’t always find the kind of table game maximums that they would at land-based casinos, but considering how many more hands they can get in an hour, that shouldn’t be too much of a deterrent. It’s also not to say high stakes games don’t exist. For instance, players looking to play online but who preference a live casino environment can play Live Dealer Blackjack at Golden Nugget Casino. There, they’ll find betting spreads that parallel live casinos ($10 – $1,000). Virtual blackjack games tend to have lower maximums, typically in the $50 – $200 range, but there are games where players can wager up to $500 per hand. Carnival game table maxes typically cap out between $300 – $800, depending on the game and the casino, while high stakes roulette games, like the Single Zero Roulette variant on Tropicana Casino, set maximums high at $4,000. Turning to slots, initially, high stakes players may be put off by the lack of high denominations. However, whereas the average land-based penny slot restricts players to top-end wagers in the $3 – $5 range, maximum wagers for online penny slots start at around $25, with $100+ caps not uncommon. Some slots, like Spin Sorceress and Monopoly Big Event at Golden Nugget Casino even offer higher returns (up to 99 percent) to players who wager at the higher limits. At some casinos (Betfair Casino being a good example), high rollers receive better loyalty point conversion rates. Lastly, high stakes video poker players won’t notice a huge difference between land-based and online games, although online, maximums tend to be slightly higher.